Haunted by the past . . .The year is 1888, and the scent of blood lingers heavy in the London air. Stefan Salvatore thought he could escape his violent origins by settling in the peaceful countryside of England, but when a heinous murderer named Jack the Ripper surfaces, Stefan fears darkness will always follow him. Drawn into the investigation, Stefan assumes the worst: This is the work of a vampire. And the more he learns, the more he becomes convinced that the killer is someone close to him—and that he can never outrun his past. Based on the popular CW TV show inspired by the bestselling novels, Stefan’s Diaries reveals the truth about what really happened between Stefan, Damon, and Katherine—and how the Vampire Diaries love triangle began. 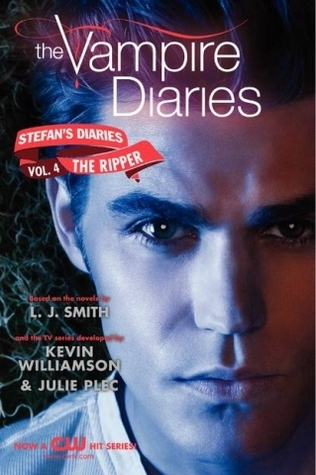 With the title of the book an instance comes to mind remember Stefan's alter-ego, the one with no emotions what so ever was called "the ripper" in season 2. But this ripper is definitely not that what you all are thinking. For its 1888 and Stefan is in London this time and sure enough Jack The Ripper is reeking havoc and somehow or the other the estranged Salvatore brothers find themselves into it. The story goes something like this - Stefan has made a little life out of London. He knows this peace won't last and sure enough a certain trip to London does just that. When he finds Damon's alias in the society pages and a horrific murder on the front page. He knows he needs to stick around and find who this murderer is and save London and this girl he has become fond of. Stefan suspects its his brother Damon who is killing people and by people I mean specifically girls. The Ripper is short and an easy read. The plot is good enough. It was a very fast and entertaining read. If you like the show you will enjoy this series. The point of Jack the Ripper was cleverly put in the plot. And for the first time we see Stefan's thoughts about the always being in the shadow of his older brother. A heartfelt thought that comes in the minds of every younger brothers and sisters around the world. "Fast and entertaining - Stefan is traipsing around Jack the ripper's London"